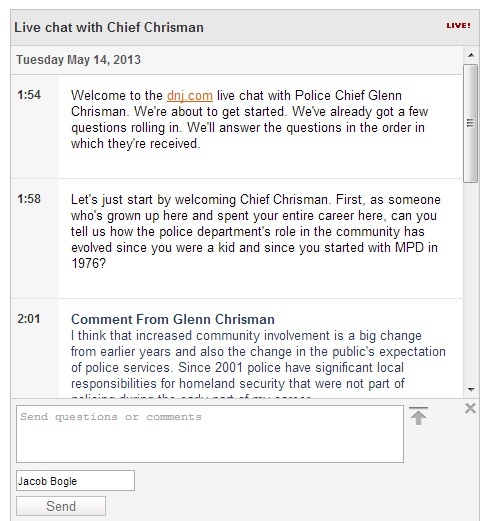 The Daily News Journal hosted a live online chat today with Murfreesboro Chief of Police, Glenn Chrisman. The chat lasted a little bit over an hour and yet only 12 questions were answered. Here is the transcript. I have left everything as it was, typos and all. 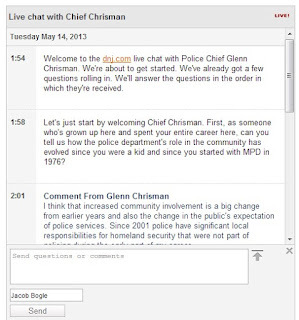 1:54 Welcome to the dnj.com live chat with Police Chief Glenn Chrisman. We're about to get started. We've already got a few questions rolling in. We'll answer the questions in the order in which they're received. 1:58 Let's just start by welcoming Chief Chrisman. First, as someone who's grown up here and spent your entire career here, can you tell us how the police department's role in the community has evolved since you were a kid and since you started with MPD in 1976? I think that increased community involvement is a big change from earlier years and also the change in the public's expectation of police services. Since 2001 police have significant local responsibilities for homeland security that were not part of policing during the early part of my career. In your presentation to the city council you mentioned that Homeland security is a priority and went as far to reference Newtown and Sandy Hook in defense of the cameras. Are you stating that if we did not have the cameras and had more officers patrolling traffic that we would have a mass shooting or terrorist attack, or be unable to adequately handle a terrorist situation? Good Afternoon, Chief. In the photo enforcement report you sent to the council on 4/30/13, you said that a new photo enforcement system installed around 2011 was an “improvement” and “helped reduced crashes overall”. However, the year after the new system was installed, crashes at photo enforced intersections rose. In particular, side-angle crashes rose over 37% after the new system was installed. Could you clarify what about the new system is an improvement? No. I think that the use of technology such as the cameras allows us to redeploy police resources for neighborhood patrols, directed patrol assignments, community policing initiatives, school education programs, and other needs. In this way, the use of technology is a force multiplier enabling police resources to be used more effectively in other areas. The improvements included a new sensor system that included left hand turns at the monitored intersections. While crashes increased for 2011/12 over the 2011 year, there had been a steady decreasing trend at those intersections from 2008/09 through 2010/11. For the period of 2007/08 through 2011/12, side angle collisions at these intersections decreased from 71 to 48, a 32.3% decrease. If side angle crash trends for the 2012/13 year continue as projected we anticipate a significant decrease for this fiscal year. For the same time period (2007/08 through 2011/12) side angle crashes at all signalized intersections decreased from 615 to 359, a 41.6% decrease. Chief Chrisman, you and the Mayor made it very clear that the purpose of the red light cameras was to enhance safety and even showed videos of accidents prior to the cameras being deployed. How would the threat of a ticket deter what were obviously drunk and impaired drivers? Would not an on site police officer make the streets safer by being able to apprehend the drunk drive then & there, instead of having to wait for dispatch? the focus of the program is to change driver behavior at signalized intersections and to reenforce the message that "red means stop". Impaired drivers are the focus of all police officers including our Murfreesboro Police Alcohol Countermeasures Team (MPACT). Last year in Murfreesboro there were 824 DUI arrests. However, in calendar year 2012, MPD officers responded to an average of over 300 calls for service daily. The use of camera technology allows us to use our most precious resources, our police officers, in the most efficient and economical way possible. With websites like 'Photography is not a crime' and public activists, what is the policy for citizens to film police in action from a safe distance and what is a safe distance? MPD actually has in-car video in most of the Patrol fleet. It is our policy to record most interactions with the public. Any citizen may film police officers from a safe place so long as they do not interfere with the officer in the performance of their duties. You mention that it would allow you to redeploy resources to neighborhood patrols, directed patrol assignments, community policing initiatives, school education programs, but how do any of these subjects relate to homeland security? In a homeland security emergency situation could you not proactively pull resources from all areas including basic patrol? I fail to see how having police patrol traffic would hinder the police department's ability to respond to a Homeland Security situation. Part of the idea of homeland security is detecting suspicious activity before it turns criminal. By allowing officers to proactively patrol, they observe activities and not only reduce crime, but gather intelligence that could be connected to homeland security threats. Timothy McVeigh (Oklahoma City bomber) was apprehended by a police officer following a traffic stop. With the push for more school resource officers following Sandy Hook, do you feel we have an adequate police presence in Murfreesboro City Schools? MPD has a team of DARE and GREAT officers that partner with Murfreesboro City Schools to provide a police presence in our City Schools. In addition to the curriculum provided, they assist teachers and administrators with school safety issues and other campus related concerns. At present, I believe we do have an adequate police presence in Murfreesboro City Schools (MCS). We are continuing to work with MCS to strengthen and improve security safety issues. If we have less police paroling traffic and stopping people at lights, would that not mean less possibility of stopping people such as Timothy McVeigh? Would that not mean less possibility of stopping drunk drivers who run red lights? In order for us to provide traditional enforcement at one red light at the same level as the automated system, we would need a minimum of 4 officers for one approach at one intersection for a limited period of time. By deploying these resources city-wide, they are able to cover more territory and observe for violations in the larger geographical area. We seemed to have seen an increase in gang activity in recent years in Murfreesboro. Can you discuss your creation of the gang task force and how effective it has been? In 2009 we partnered with CADCOR to implement an anti gang education program for at risk youth and a gang investigative unit whose focus is to investigate and prosecute gang related crimes. The Gang Resistance Education And Training (GREAT) provides anti gang education which begins at the fourth grade level in selected Murfreesboro City Schools. We believe that anti-gang education prepares children to resist gang recruitment efforts, and that target enforcement of criminal violations committed by suspected gang members has improved the safety of our City and its neighborhoods. If we aren't spending money on having officers at the intersections, and if ATS are the ones who operate the camera system, what is the $740,000 allocated in the budget to red light cameras spent on? When ATS upgraded the system in 2011 the capital investment in the infrastructure replacements was approximately $2.4 million. The expenditure in the Police Budget represents payments to ATS to defray the cost of this infrastructure investment which was no cost to the City. Violators therefore pay for the enforcement of red light violations. Of course they are able to observe for more red light violations, but again how does that help prevent or stop drunk drivers? If Timothy McVeigh got an automated ticket in the mail, would that have stopped him? If a drunk driver gets a ticket in the mail, does that stop them from potentially wrecking into someone after the red light violation occurs? If officers are able to focus patrols and call responses on other police duties, excluding red light enforcement, they have more time for DUI enforcement, selective traffic enforcement, suspicious activity investigation and reporting among a myriad of other duties. We'd like to thank Chief Chrisman and all of our readers for participating today. We look forward to future live chats. I understand you all have a Peace Officers Memorial Day coming up this week. Could you tell us about that? I would like to invite the readers to come to the 2013 Peace Officers Memorial Day this Thursday at 9:00am on the Civic Plaza (outside City Hall). The day was set aside by Congress to honor and pay respect to officers who gave their life in the line of duty. Locally, we have lost 9 police officers. Trooper William James, MPD Officer Herbert McClanahan, US Deputy Marshal Sam Vaughn, Trooper Lewis Hendon, MPD Officer Butch Tomlinson, MPD Officer Kay Rogers, MPD Officer Matt Lovejoy, and Trooper Andy Wall will all be honored. Please join us in remembering those fallen officers. Thank you for the opportunity to participate in this live chat. The main participants were myself, Axl David and Tim Meredith, and the three of us are co-founders of the Murfreesboro C.A.P.E project. Taylor Loyal is a DNJ employee and was the moderator. We asked several questions which were not answered including one dealing with the fact that a person who is caught by a red light camera is under no real obligation to pay since the City cannot force them, it is not listed against their driving record and collection agencies cannot list it on their credit report. Another question dealt with the efficacy of the system and since that there is no direct evidence that the camera system works, why should we install more of them? In response to the recent Murfreesboro Post article by Jonathan Fagan. Your recent article concerning the City’s red light camera system was not exactly accurate and more than a little biased. According to the Chief of Police’s report, the total number of crashes (of all types) between 2008 and 2012 has declined 11% per year on average. However, the number of crashes seen at camera enforced intersections has only fallen 1.1% per year on average. This clearly shows that the camera enforcement system is not working as expected. Furthermore, side-angle crashes at enforced intersections have decline 32% since 2008, while the decline at all intersections has dropped 42%. The overall trend is a decline in intersection crashes unrelated to the camera system. In fact, between 2011-12 side angle crashes at camera enforced intersections rose 37.15% compared to a decline of 42.1% at all intersections. TCA 55-8-198 (and related sections) makes it plain that a violator who does not pay their fine will not have their failure to pay noted on either their driver’s license record or their credit report. Councilman Smotherman’s point was simple – the law, as written, lacks teeth, and in reality any driver may simply ignore their citations and the City is without recourse to force them to pay. Additionally, the system sets up two different punishments for the same crime, a potential violation of the Equal Protection clause. Consider this: An individual runs a red light and is caught by the camera system. They are issued a citation and refuse to pay it (as 70% of those cited do). The violation does not appear on their record and even the collection agency is prohibited from listing a payment failure on their credit report. Another individual runs a red light and is caught by a physical police officer, they are cited and any failure to pay can result in arrest. The citation itself is also noted on their driving record. American Traffic Solutions (an Arizona based company that runs the system) receives 50% of the citation fee which, since 2008, amounts to $1.87 million that has left our community and gone to an out-of-state company. And while Mayor Bragg has insisted that safety is their main concern, ATS specifically states that their systems are geared toward providing a revenue source for municipalities. The videos shown of intersection accidents are a prime example of why the red light camera system fails to offer safety. The offending drivers were not simply running a red light; they were driving incredibly recklessly, were drunk and showed no regard for the safety of others. The threat of being caught on camera is hardly a sufficient deterrence. If there was a police officer watching the intersection, in person, they could have apprehended the driver then and there and prevented any further accidents down the road. As the system stands, the drunk driver could continue on for miles before a police officer catches up to them. ATS, a private company, is doing the work of the police and yet is free from any oversight. No one knows how long they keep the day-to-day video they capture, nor do we know if they sell the information they receive or if their systems are protected from computer attacks. Seven states have banned the use of these camera systems and numerous cities have removed them from their streets. On top of that, courts in California and Missouri have ruled against these systems, citing for one thing - a major conflict of interest. We at Murfreesboro C.A.P.E are committed to having these cameras taken down and to return the running of our city, and its agencies, back to the citizens of Murfreesboro. The City of Murfreesboro is located at the geographic center of the State of Tennessee. It has a certified population of 109,031 (July 2012 census). The City’s population growth has exceeded 42% per decade on average. Note: Personnel counts include full and part-time employees. The averages are based solely on the number of employees. All budgets are limited to “personnel costs” only which includes salaries, overtime, medical, retirement (401a), insurance, Social Security, pensions and worker’s compensation. In all, the City lists 787 employees. [1-pg 288] If we divide the number of employees by the amount allocated for personnel ($57,134,566), the average City employee makes $72,598. Of course most employees make a good deal less than this (as little as $21,000) and others, such as the City Manager, can earn as much as $163,856. For a full list of pay grades please see pages 283-287 of the City’s budget. All of this means that each and every man, woman, and child in this city is burdened with $56,319 worth of public debt. Tonight, the Murfreesboro, TN City Council approved a 25 year plan to add an additional 150 miles or so of new greenways and bike paths to the Murfreesboro Greenway System by a vote of 4-3. This plan had a minimum cost of $104 million - with no current financial security. Tonight's vote was the final step of a process that began several years ago. I and many others made our views very clear and at times they were impassioned pleas but in the end the Council ruled, in all their wisdom, that this was something worth doing. There is little chance of stopping the ordnance now, at least until the next election, and I wish I had made my little speech with greater force but all I can do is make my case here in hopes that it can be used in future discussions. I will start by repeating what I told the Council as my opening remark. "When governments use money for something, be they the federal government or local, they are by definition taking money from someone else." At first glance the idea of greenways and bike trails sounds really nice. Currently Murfreesboro has 12 miles of riverside greenways and they are used fairly often. 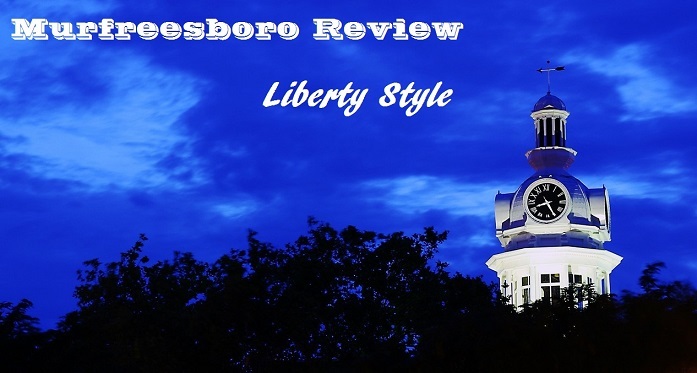 Murfreesboro is also a fast growing city and so the expansion of the system sounds like a logical step to improve the over-all quality of life for the city's inhabitants. The problem is that whenever government decides it needs additional land to expand something it almost always comes from private citizens. The City's vice mayor, Ron Washington, assured us all that this was simply a "plan for the future" and that nothing was set in stone; no ones land was being taken. And yet, two landowners rose and testified that they had been approached by city agents discussing the acquisition of their land for the Greenway expansion project including a man who turned a rundown property 27 years ago into his own paradise. Another had his land appraised by the city at $1,000. $1,000 for 1.6 acres of well maintained land, with 300 feet of river front and a re-enforced concrete private bridge spanning the river. Several spoke out in favor of the project and a few even asked that the city go above and beyond the current plan. A supporter said (paraphrasing) "When you break it down you're only spending $4 million a year, well worth it." Of course that ignores the simple fact that what they're asking for is the local government to seize private property for the benefit of the few. Vice Mayor Washington added that land seizure is "unfortunate" and "the cost of doing business." I doubt he would feel the same if it were his land being taken. Proponents also discussed the positive environmental impact of such greenways. They claimed that the greenways connect small parcels of natural spaces and help wildlife move about. I find that somewhat illogical; in order to protect the natural environment they want to clear cut an area some 45 feet wide and extend that along hundreds of miles; something another opposition speaker mentioned. Then they want to pave a 15 foot wide section of it for all those miles. From an environmental standpoint, the first few feet of soil (depth) and the plants that grow above are instrumental in filtering out pollution and keeping soil erosion at bay. Clear cutting and paving over miles of territory will negate this natural action. The cleared land will remove the trees and bushes, along with their roots, and replace them with a single species of grass - so much for biodiversity. The paved portions then become a strip of open run-off with no ability to protect the rivers and creeks from surface pollution. One needs only look at the Greenway section which goes along Lytle Creek and beneath Broad Street. Lytle Creek is incredibly polluted at that point. In fact, much of street runoff city wide goes directly into the very waterways they're professing a desire to protect. Not only does the paving of natural areas to protect natural areas strain the rules of logic you must ask yourself, why are there so few green areas today? The answer is rather simple. The government has continued to approve new constructions, new annexation of properties, and helped to direct the course of environmental destruction. So now, we're asking government to solve a problem it had a hand in creating. Then there is the economic factor. In a time when every working citizen has had to adjust their budgets to reflect the 2% increase in their taxes and everyone has had to factor in higher gas prices it boggles the mind that our leaders would think such a plan is a good idea. You can't drive to the local mall without seeing homeless people begging for money or a job, but this is a worthwhile expenditure of resources? Supporters have brought up the fact that some of it would be paid for via federal grant money, however, this is a 25 year plan and it is completely foolhardy to expect that the federal government will continue to dole out funds as they rapidly approach insolvency. The plan also did not take into account the cost of paying "fair market" value for the confiscated land nor the costs for continual maintenance. The plan would cost approximately $700,000 a MILE just to build. Then the City will be on the hook for the additional employees they will need to hire to mow the grass, trim the trees, repave the paths, replace damaged signage, and the additional man-hour costs for security which I will discuss in a moment. All of this is at a time when the City is $396 million in long-term debt, more than double that of 2004. Yes, our debt is slowly being paid off, however there is still no mechanism in place to pay for this program. A number of supporters talked about the fact that so many families use the system and how they feel safe and love going there. For them, this may be the case. Yet for others, not so much. Even one of the Council members expressed the fact that he did not feel safe on the Greenway and others talked about their cars being broken into. There are many examples of crime on the system which are not limited to adult victims. I also told them that one need only step off the cleared path to find any number of less than enjoyable problems. 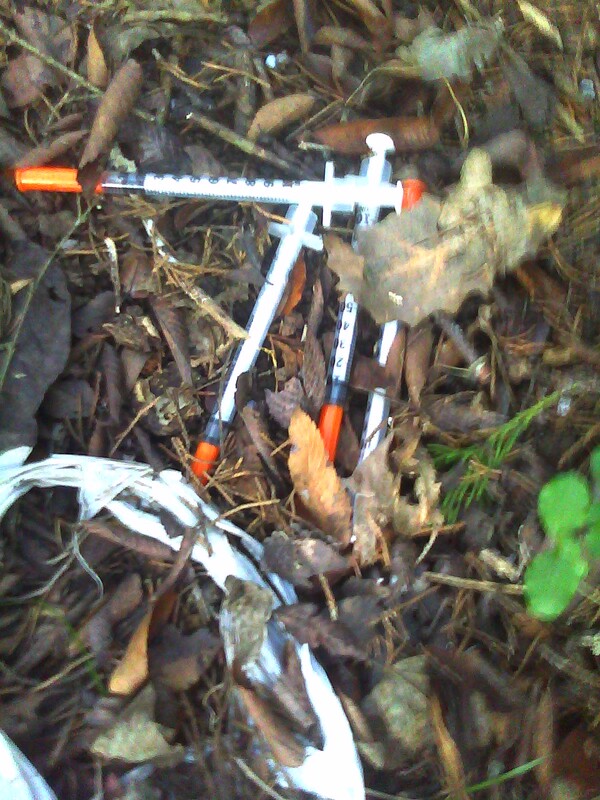 For example, the Greenway in and around Old Fort Park (a very popular park, especially among children) has illegal encampments of homeless people, used condoms and drug paraphernalia can be easily found. I showed the Council a picture of 4 hypodermic needles which were within 100 feet of the Greenway path right in the middle of the park grounds. If the City can not adequately protect the 12 miles of paths we have now, how do they hope to protect the additional 150 miles of paths? Most of the paths lead away from the city's core into areas that tend to have a smaller police presence. A good many people, including myself, have stopped using the system for this very reason. To me, this is a very real a grave concern; one the Council decided to ignore. In the end, we have a city in debt who wishes to go further into debt for the sake of recreation. There are multiple parks, recreational facilities and the current Greenway system is popular. That being said, no one is complaining about the crowding, no one has to endure "people-jams" on the Greenway and many citizens flat out do not use it. No one suggested that we destroy the Greenway we have, we just don't think that robbing people of their land to build a massive expansion or financing it with debt or money likewise stolen in the form of taxes is the best way to go. If we need new paths let's build them as we grow. It is a sad state of affairs when we can not finance our own programs without begging for federal money, money that never comes without strings or moral hazard. As I said, the vote happened and for now there's little we can do about the situation. However, I think this issue should be kept in our minds and remembered during the upcoming election. We may have to wait but there is no reason why we can't reverse this action if we have leaders who will actually defend the rights of citizens and not try to be "progressive" (as some members suggested we expect of them). Rather, we should be a city which places a great importance on private property rights and does not plunge itself into greater financial troubles for recreation. City Council members Feel free to message Gilley, Harris &amp; Smotherman to voice your thanks, or to message the others and let them know you won't forget this.